Major ground works have taken place during the summer to prepare for connecting the building to the main heating and utilities supplies to campus. The foundations have been laid and the building steel structure is now arriving and taking shape. Away from the construction site we have been busy considering a lot of the finer detail. The building project has both a steering group and working group to consult on and take key decisions, with members including faculty representation, library, space and Students’ Unions. As with most projects, we have undertaken a ‘value-engineering’ round to make sure we can deliver the project within the budget envelope allocated. This is not always easy, and we have had to find ways to downgrade certain infrastructure items, materials, etc. without compromising the vision and functionality of the building. However, we were also able to retain or push for important features to make sure the building is a high quality and accessible learning space, including internal glazing, digital signage, power socket provision, large teaching walls and high quality, full-height toilet cubicles. We have also agreed on an open door policy, making the space free for anyone in the University community to walk in and use whenever it is not booked. 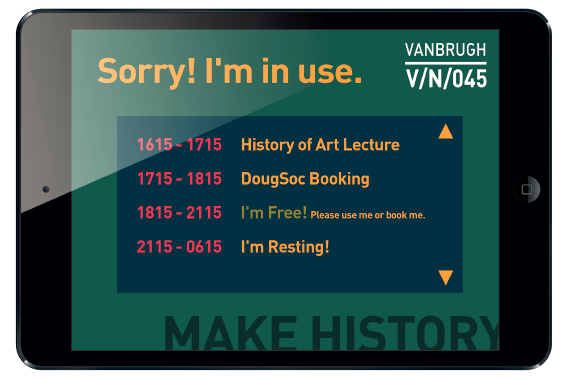 We hope to use clever digital signage to show when the room is available. The future of signage at York? The building will include a 350-seat theatre, based on the required need for the teaching timetable and ancillary events. The dimensions of the theatre are fixed, and we’re proposing fixed benching as the writing surface (not flip-top chairs!) with power sockets along every row, but there is plenty of scope to explore different seating arrangements. We are currently proposing two large projectors at the front of the theatre, angled to provide the best coverage for all members. With supporting technology, this allows for dual projection, eg a visualiser with other inputs in addition to presentation materials. Given the size of the projectors required and the space available at the front of the theatre, we are limited for board space so our proposal is to include writing boards at the front for mid-sized lecture use. What technology do you think should be provided in lecture theatres? Is two projectors correct? Would one suffice? Should there be writing boards at the front of the theatre? The new building will offer 26 seminar rooms, each with around 20 seats each and designed to allow sufficient capacity for a varied and flexible layout, eg boardroom, classroom or other configurations. What would you like to see in our new learning spaces? Are there learning spaces you like on campus, elsewhere, meeting spaces in other industries or organisations? Is power important to you to plug in? How often do you need to do this and how do you think we should provide this? We have two larger informal learning spaces and various smaller spaces throughout the building that we will be developing over time. With about 1,000 people in the building during the changeover period between lessons, we need to provide enough space for people to comfortably move around, and provide breakout space for before, during or after formal learning. The specification of the informal spaces are led by Liz Waller, Deputy Director of Information who spearheaded the Harry Fairhurst Library extension. What you think works in the Library and elsewhere? What you would like to see more of in the Spring Lane Building? Drop in and have your say! Come along to one of our Learning Spaces Roadshow events this month for your chance to enjoy some food and drink, view the latest drawings and samples, and speak to staff involved in this and other projects. If you can’t make any of these sessions in person, we would still love to hear from you. 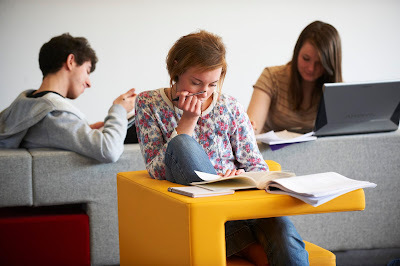 Email learning-spaces@york.ac.uk to let us know what you think!